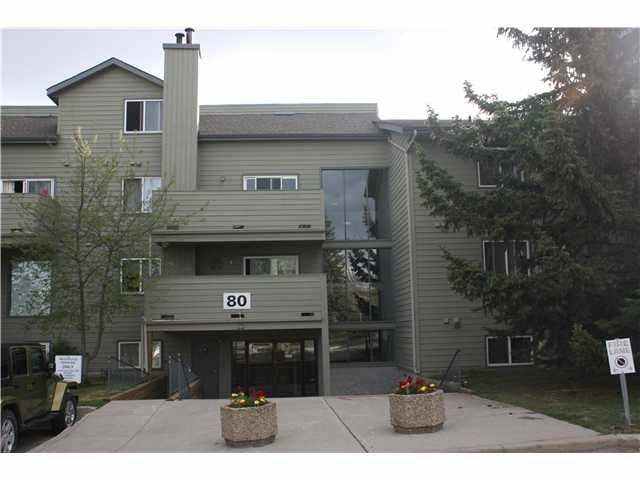 SUPERB LOCATION....LOW CONDO FEES....MOUNTAIN VIEWS. Beautiful spacious 1 bedroom condo, big enough to fit a king size bed and still has an oversized closet. Kitchen offers tonnes of cupboards and counter space. Bathroom (5 piece) offers dual sink and a full size washer and dryer. Living room is open concept and features a wood burning fireplace. Plenty of storage throughout and also has storage room in-suite....BONUS storage locker outside on your very own private balcony surrounded my beautiful Spruce trees. The window in the master bedroom and patio doors has recently been replaced. Almost everything is included in the condo fees....you just have to pay for electricity and cable. NO NEED FOR A CAR!!!! Everything that you need is within walking distance. Co-op grocery and London Drugs is just down the street, Westhills shopping centre, movie theatre, shops, restaurants, big green space just across the street, pathway and just minutes to Downtown, Mount Royal University & public transportation.